Horses are majestic creatures and are known for their rich symbolic meaning across many cultures. 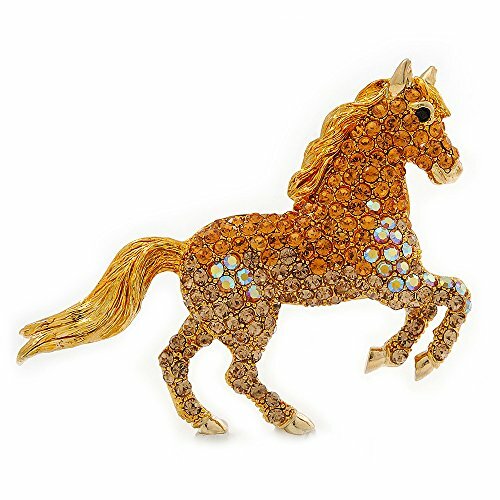 The lovely detailing on the mane, tail and body on our gold plated brooch help to make this a sensational example of a piece of horse jewellery that will make a wonderful addition to any womans jewellery collection. The horse pave set with sparkling top grade Austrian crystals in shades of orange-gold, citrine and AB. The eye made of a single black stone. The horse measures about 65mm L x 45mm W, and secures with a flag pin/revolver clasp. If you have any questions about this product by Avalaya, contact us by completing and submitting the form below. If you are looking for a specif part number, please include it with your message.